What should a prospective letterer have in her/his/its portfolio, and how big is the demand for letterers these days? 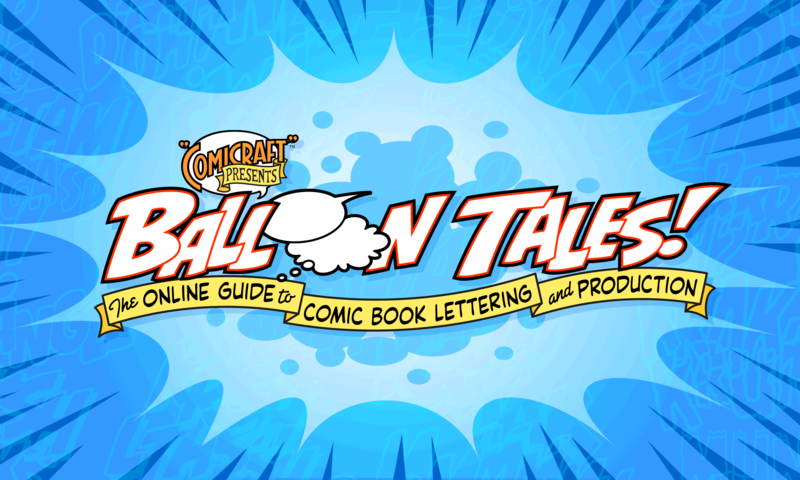 Richard: One short strip expertly lettered should be enough to get you lettering work — make sure it has a title and SFX and perhaps some special lettering or balloon styles. A dozen logos (print one logo per 8.5 x 11 page), either original designs you may have created for class or friends and family or re-interpretations of recognizable properties (design a new logo for, oh, I don’t know, off the top of my head, let’s say BLADERUNNER?!) should be enough to get you logo design work. Charge anywhere from $50 to $100 to $300, $500, $600 or $1000 depending on the amount of sketches required and the level of complexity (if it’s to be rendered in full color in Photoshop we charge a little more). Richard: Have you looked down the back of the sofa? On the table by the door? On your nightstand? Your purse? Your pocket? More importantly — do you know where your towel is? Do letters tend to work at their homes, or do they tend to wake up and go to the office from 9 to 5? You also find them in libraries, phone books and some gather in hives. LetterERs do tend to work at home — JG and I do. But when Comicraft had 15 employees, I had a big studio in Santa Monica and we worked 9-5, with lots of overtime! Now that the bigger companies letter a lot of books inhouse, DC and Dark Horse and Tokyopop have lettering opportunities inhouse, if you’re willing to live in LA or NY. Write them a letter if you’re interested, you never know. How many books a month does one letter have to do to make a good or even a decent wage? Richard: Anyone lettering comics for a living has to be lettering at least a book a week. To make a decent living, I’d say six to ten books a month. Unfortunately, most DC and Dark Horse books are lettered inhouse and Chris Eliopolous has a contract with Marvel to letter the bulk of their books with assistance by letterers who used to work in the Marvel Bullpen. I blame the availability of top quality fonts from those awfully nice chaps at www.comicbookfonts.com. Now, old timers like Todd Klein and Tom Orzechowski might tell you that there’s no room for letterers in the comic book industry right now, but that’s just cuz they don’t want any competition. It’s like the barber who tells you that not so many people come to get their haircut any more. People ALWAYS need to get their haircut, but when you suspect that the guy cutting your hair hasn’t got his heart in it any more, you go somewhere else — and sometimes you pay the enthusiastic upstart MORE to do the same thing! People will ALWAYS need comics lettered — look at the booming manga business — who do you think is lettering SHONEN JUMP and the TOKYOPOP line? Youngsters working for about $5 a page with fonts, that’s who! I worked for FREE for a year before getting breaks at Marvel UK and 2000AD. So, if you’re interested in lettering comics, buy some fonts, or better yet, develop your own, submit your work to the smaller publishers who are paying less but offering more work, and get to it! And be sure and buy some pencils from me and JG when you see us on the street corner five years from now. God bless you, ‘ope ya live to forty-one. P.S. Charge between $5 a page and $20 a page until you’ve built a reputation and when there’s demand for your work (and the industry is healthy), charge MORE! Chaos paid us $75 a page for a year or so (after I tried to drop their books!) and one lucky — and talented — letterer was getting $150 a page to work on SPAWN and didn’t have to letter anything else (lucky for us, heh!). I’ve seen talk online recently about colorists and their future in comics — it seems like every few years a couple new groups of competetive-but-inexperienced colorists pop up, willing to color books for less…in hopes they’ll eventually get a chance to up their rates to something dignified. The only problem being, they never get a chance…’cause before you know it, yet another group of inexperienced colorists pops up willing to do it even cheaper. This seems like it’s been allowed to happen so far because readers aren’t always the most observant when it comes to anything but the main art itself. Lettering is usually most effective when it’s done so subtly and so well that the reader isn’t even completely aware of it — the letterer’s job is to be invisible. As a result, readers are about as observant of lettering as they are to colors…do you fear a similar problem could occur with lettering as is sort of happening with colors? Or is there some of that going on already? Richard: It doesn’t matter if you’re a writer, artist, colorist or letterer, or, for that matter a hairdresser, teacher, management accountant or basketball player — you’re ALWAYS going to be looking over your shoulder at the young turk with the Jedi mind tricks. Ask yourself this question: Are you going to worry about wolves when they have their jaws around your neck, or are you going to worry about them when they’re at the door? JG will attest that I started worrying about wolves when I found out they EXISTED! I’d seen the way the comic book industry discarded people they had once depended on and, if anything, the mistreatment of artists, writers, colorists, letterers (and editors!) has only gotten worse. You’re only as good as the last job you did at an affordable price. The same is true in the movie industry and the TV biz. We built comicbookfonts.com as a safety net (and it has some holes in, which could be fixed by a few orders of, say, $99 each!) and we’ve been building Active Images as a second net under the first. JG does a great deal of web design work for a number of clients who aren’t comic book industry clients, and I write novels. In crayon. I haven’t had any of them published yet, but, oh yeah, waitaminute, I’ve been publishing my own work, haven’t I? HIP FLASK, now available at all good comic book stores. So, my advice is this — Nil Illigitimum Carborundum. No, that’s not “Romans, Go Home,” it’s “Don’t Let the Bastards Grind You Down.” Work on your abilities, treasure your working relationships, diversify and Watch Your Back, cuz if you don’t, someone else will. Oh, and Be Nice to Each Other. I want to know if hand lettering is still en vogue? I like hand lettering. John: We prefer to call it “pen lettering”. A pen is a tool, just like a computer. Lettering with your hands is actually very messy, I wouldn’t recommend it. flow now, computer lettering fits in much easier. So even if you do pen lettering, it’s good to know how to scan your pages and provide files the composition person can use. Richard: I like pen lettering, too, now that I don’t have to live with hand cramps and an ink-stained callous on the middle finger of my right hand. But because comic books are now, by necessity, a global market, I think pen lettering as a career has gone out the window. That doesn’t mean you can’t create letters in pen or pencil — and there’s nothing to stop you from sketching out logos and titles in pencil before scanning and digitizing them. There’s still a drawing board by my desk. I was wondering what makes a BAD font. You’ve talked about what fonts not to use, but I don’t remember you saying why they’re not good, or what’s not good about them. I know there are some with some pretty funky kerning, but in general, I find lots of fonts out there and I can’t see specifically why they’re bad. John: I find that fonts are like most anything else — you get what you pay for. Most of what you’ll find (legally) for free is going to be amateurishly constructed. That includes kerning as well as the cleanness of the letter shapes, and the way the font works overall as a whole, both for readability and consistency. If you’re thinking about creating fonts, open a bunch of them up in Fontographer or TypeTool (see below) and take a look at how they’re constructed. Or just type out words at a really large size in Illustrator and “Create Outlines” to see how the handles look. Letters in fonts you’ve downloaded for free will generally look like the example in box #4 on page 35 of our book, where the ends and points have not been fine-tuned. This isn’t always noticeable at small sizes, but when you blow it up big, the sloppiness is obvious. This also causes problems when you add a stroke to the letters, and all sorts of weird points stick out. Take a close look at one of our fonts, and you’ll see that all the ends and corners are sharp or smooth where they should be. We also take time to kern all the common letter combinations, and since we also use our own fonts, we do a lot of fine tuning along the way, so we’re sure each font works well as a whole before we make it available for sale. Is there any limit to the number of sound effect fonts you use in any particular comic book? Richard: I like to limit the SFX styles we use on a book to two or three — or ONE for Tim Sale (BiffBamBoom). We try to give each book a unique style that way. Dave Gibbons used just one lettering style for SFX in GIVE ME LIBERTY, we made a font for him based on his pen-in-hand drawings in the book and called it Belly Laugh. I am a loner. I don’t like to work with people. Ever. Is it really THAT hard in the USA to make a name for yourself, by yourself? Do I NEED to sign up with one of the big publishers to even have a chance? Working on other people’s books just doesn’t appeal to me. John: One of the great things about comic books is that they can come completely from the mind and hands of one person. Unlike, say, moviemaking, which takes dozens to hundreds of people. That said, it is incredibly difficult for one person to create and publish a monthly (or even bi-monthly) comic all by themselves. You have to be incredibly driven and organized to do so, and you will probably have little or no life outside of producing, publishing and promoting your comic. Live simply, and put your book out on time, every time (that will make a HUGE difference to retailers), and at the end of thirty years you might even be able to retire on back catalog sales like Dave Sim. If that’s the life you’re after, it absolutely can be done. I tried it for about a year and completely burned out. If you want to know more about how to do it, here’s my general overview of the process. Richard: If I had to live my life over again, I’d have never stopped drawing from the age of 4, skipped math classes, stayed well away from Marvel Comics and figured out a way of self publishing in my early twenties. It’s tough but NOT impossible to go it alone, and I suggest you give it a try — Dave Sim and Jeff Smith are the creators who very noticeably chose the Road Less Traveled, but there’s also Gary Millidge, Phil Yeh, Paul Grist, Eddie Campbell, Al Davison, Chester Brown, Joe Matt, Marjani Satrap, Art Speigelman, Carol Lay, and let’s not forget Matt Groening, Bill Watterston, Cathy Guisewhite, Charles Schulz, Posy Simmonds, Raymond Briggs, Dr Seuss, Giles, Bud Handelsman and hundreds of cartoonists whose styles have become famous throughout the world. Marvel and DC and the other well-known bigger small publishers are NOT the be-all and end-all. They are great places to get paid for learning your craft, but they’re also dead-end prisons. Always go in with your escape route planned out well in advance! What is a common mistake that letterers include on their pages that they shouldn’t? What are the common trends that are smart to stay away from? And what’s your trick to make your lettered pages stand out from the rest trying to break in as letterers? John: CROSSBAR “I”S IN THE MIDDLE OF WORDS!!!! Aside from that artists are going to look for aesthetic things like good placement choices, consistent tails and space in the balloons, and good word arrangement. Make their art look as good as possible and they will love you. A writer or an editor is going to want accuracy, like no spelling errors, consistency with the script, and an obvious reading order. Make their job as easy as possible (the fewest amount of corrections) and they will love you. Just as important as the finished work are your working relationships. Are you reliable? Flexible? Easy to get a hold of? Easy to talk to and collaborate with? These matter just as much to people you will be working with. The only way that Richard was able to convince editors to let him letter books with the computer (and they really, really fought it) was because they already trusted him to turn in quality work on time. They gave us a shot on some of the low-selling books, and when the results were good (and they started to see some of the advantages) we quickly moved up the chain to the top sellers. Probably the best way to prove yourself when you’re breaking in is to find a small press publisher willing to pay you a few dollars a page (basically to save them the trouble — most of them hate to letter). Then once you have your work published in some books, and a reference who can vouch for your reliability, start approaching larger publishers. One other piece of advice for anyone who wants to become any type of independent artist: if you need a job to pay the bills in the meantime, choose one that requires the least amount of mental effort. You will hate it, which will motivate you, and it will leave your brain free to imagine and create while you’re at work. If you take a job you somewhat enjoy, it will likely become your career instead. The further you get in life, the more important that paycheck becomes. The second biggest mistake is believing that the world owes you a living. I hear this from young and old letterers alike — if you think that once you’re in, you’re in, you couldn’t be more wrong. your very best ALL THE TIME! In recent years, Comicraft has fallen a little from favor, partly because we grew a little complacent (and exhausted), partly because the availability of our Top Quality fonts diminished demand for our services and partly because letterers who were regarded as second best started working harder, dropping their prices and signing long term contracts. I don’t hire ANYONE who isn’t prepared to start working here in the studio with me, 9-5, M-F. I don’t subcontract and I don’t hire letterers with previous experience any more. Way back when, I hired a couple of letterers from Malibu Comics, and they came with a lot of bad habits. Breaking people out of bad habits is a lot more difficult that training people to have Good habits. One of the letterers in question had a tendency to show off (he was and is a talented cartoonist, and I would often tell him that he was trying to draw the story with the lettering!) and I’d also say that showing off is another easy mistake when you’re starting out. Remember Rule #1 (storytelling)! I’ve been wondering on how one goes about creating one’s own font. Do you choose an existing font and just change it? Richard: Um, picking an existing font and changing it is Adapting a font, not Creating one! Read page 35 in our book and look up Todd Klein’s tips in his book. Find a friend with nice hand writing if your own isn’t up to snuff, or create your own style by studying other people’s work. John: On the technical side, Fontographer, Fontlab and TypeTool are the apps available for the Mac. Even though it hasn’t been updated in 10 years, Fontographer is still my favorite to use. It will work in OSX classic mode if you install it properly. It’s still available direct from Macromedia, and I’ve also seen used copies pop up on Amazon occasionally. FontLab is OSX native, and can do just about anything possible when it comes to creating fonts. But it’s incredibly difficult to understand and costs $579 or something. TypeTool is a $99 stripped down version of Fontlab which I have not actually used, but from what I can tell, will probably do most everything a beginning font creator needs. Opening up existing fonts and modifying them is a good way to learn the process, or tweak something to get it where you like it. But don’t ever claim something created that way is your own creation! Another well-known comic font creator did this with one of our fonts, and then made it available free on the web as if it was his property. Even though he continues to rip us off conceptually, he at least knows to create his stuff from scratch now. If you’ve got any interest in trying font creation, I really recommend it! It is by far my favorite part of this job. There’s an infinite number of ways to present the alphabet, and seeing a font come together and become something useable, is a real thrill. Yeah, I know — I should get out more.